For all the kids in Phoenix and at the Wrigley Institute: Stefan Mrozewski is one of our three Canadians on board but more importantly, he is our Logging Scientist. That means he’s responsible for coordinating what measurements that are taken of our borehole after we’ve done our coring, what tools and sensors are used to do the measuring and how the data from the borehole is analyzed. He is called a "logging" scientist because he "logs" various information about the borehole with depth (i.e. how big the borehole is at every depth, how the density and temperature changes and what the borehole looks like.) The information that he generates helps the scientists make very important decisions for the CORKs. Being the Logging Scientist means lots of math and science, though, but Stefan has it all handled! Good thing he knows his stuff – we’d waste A LOT of time, money and energy if he didn’t! Stefan uses all kinds of math – from fractions and decimals to geometry to calculus and everything in between. On shore, Stefan designs the tools we use in our boreholes that requires using rulers, calipers, formulas, fractions, and complicated equations. Even when Stefan goes to sea, he brings along math books to keep his mind fresh. Math is THAT important! With all that math though, there’s still more Stefan wishes he could do. If he knew more the complicated math required to design tools and computer programs, he wouldn’t have to rely on his co-workers to do it for him. So, what advice does Stefan have for all of us still learning our math? "Take the time to learn it. DON’T copy or cheat. You will be better off really learning and understanding it." Stefan has had an interest in geology and nature from a very young age and it’s a good thing too! Because geoscience and the other sciences are also important to the career of a logger. 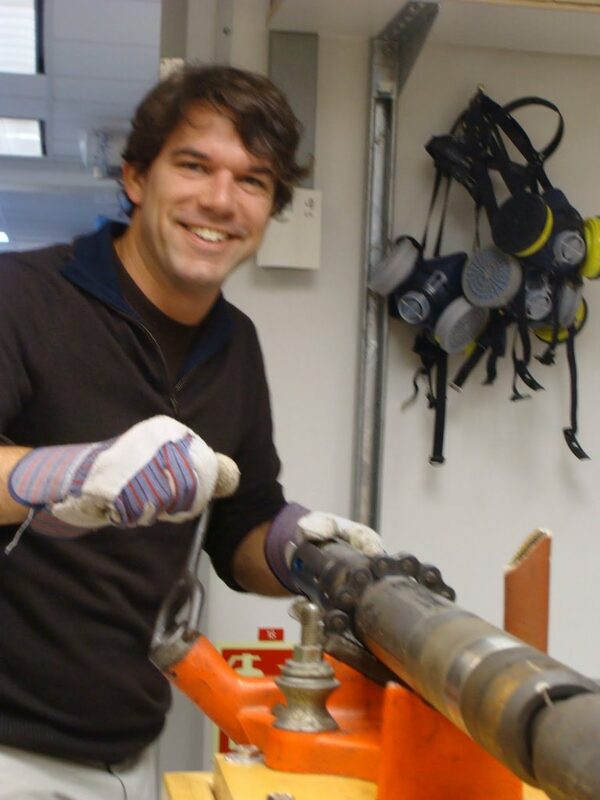 Stefan uses a lot of physics, geology, basic chemistry, electricity and magnetics to design the best tools for the logging. He also needs to be familiar with the material he is logging and the science objectives of the expedition. Computer science is also extremely helpful when Stefan needs to diagnose problems with the tools or computer programs. He also needs all this science to interpret the data that we get from the borehole. Imagine having a ton of cookies in a jar but no hands to pick them up. That’s what it’s like for a scientist to have tons of data but no knowledge to interpret it. That would be a big time bummer! Thank goodness Stefan has that knowledge! Stefan works with lots of tools like those to the left. They all get attached to a strong string called a wireline and get lowered into the seafloor all the way to the bottom of our our borehole. Then Stefan coordinates with the drill floor guys to pull the wireline up at a certain rate so that the tools can make lots of measurements at different depths. So, his tools are essentially our eyes in the rock where our cores are from. The data he brings back show us what we can’t dive down there and see – pictures of what the borehole really looks like, its density, its temperature, its size, etc. It’s like being in a Magic School Bus that travels down deep into the Earth’s crust! "Seeing" what conditions are like down there helps Dr. Andy and all the scientists decide how deep to put the experiments that go in the CORK. We’re interested in specific layers below the seafloor and the logging helps us find them. Good thing Stefan is able to show us what the Earth looks like down there without us shrinking ourselves down in a magic bus! Thanks Stefan for being our eyes and ears down in our boreholes and for knowing all that math and science!